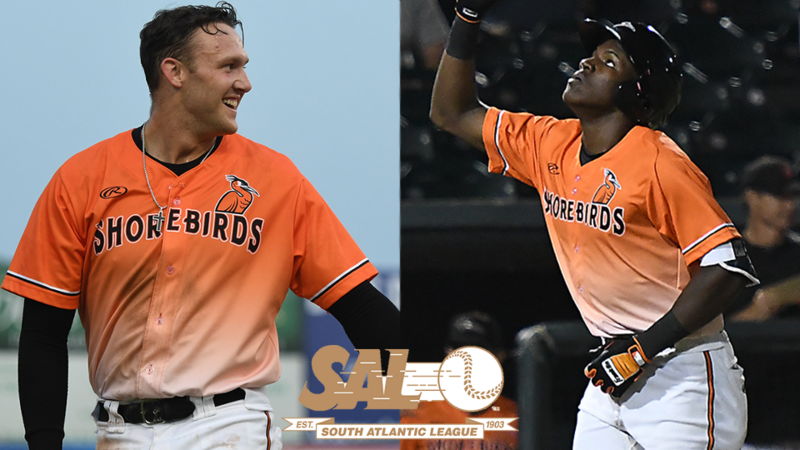 CLEARWATER, FL - Recognized for their months-long excellence, Delmarva Shorebirds third baseman Jean Carlos Encarnacion and outfielder Zach Jarrett have been named to the South Atlantic League Postseason All-Star Team, announced by the league office on Tuesday. Encarnacion was tabbed the league's top third baseman, while Jarrett made it as utility outfielder. Jarrett, a 23-year-old prospect from Hickory, N.C., is batting .276 this season with 14 home runs, 67 RBIs, and a .785 OPS. One of the iron men of the Sally League, he ranks top-five in the SAL in games played (122), hits (130), at-bats (471), total bases (209), and runs scored (72). He leads the Shorebirds in all of those categories and has mashed a team-best 45 extra-base hits to boot. Jarrett introduced himself to Delmarva in a big way during his season debut on April 6 against Asheville, making a leaping catch against the wall in left to rob fellow Postseason All-Star Bret Boswell of a home run, and clubbing a homer of his own in his first at-bat. That kick-started a scintillating that ended with Jarrett being named Orioles Minor League co-Player of the Month. The exclamation point came on April 26 when he hit a two-out, two-run walkoff home run to beat Kannapolis. One of the Shorebirds' four Midseason All-Stars, Jarrett closed the first half batting .406 with a 1.021 OPS over the final 17 games before the break. He kept up the pace in the second half, slashing .356/.411/.495 in the month of June. Big moments seemed to find Jarrett in large doses. On July 20 against Greensboro, he came to bat with the game tied 2-2 and the winning run at second with two out in the ninth. With the count 3-0, Jarrett attacked and broke his bat on a grounder that shot over third and into left, bringing in Mason McCoy with the winning run. In the Shorebirds' next game to kick off a July 22 doubleheader, Jarrett did it again, lacing a single up the middle to bring Cadyn Grenier home from second and lift Delmarva to a stunning 4-3 win. The Orioles drafted Jarrett out of the University of North Carolina Charlotte in the 28th round of the 2017 MLB First-Year Player Draft. His signing scout was Rich Morales. Encarnacion, a 20-year-old prospect from San Juan de la Maguana, D.R., was already a big name in the Sally League when he came to the Shorebirds from the Rome Braves on August 3. Through 118 games, including 21 with Delmarva, he is batting .283 with 26 doubles, seven triples, 12 home runs, and 64 RBIs, good for 45 extra-base hits and a .761 OPS. Encarnacion ranks top-five in the league in average, hits (125), and total bases (201). In his team debut on August 3, Encarnacion didn't miss a step, going 2-for-4 with a double; the next day he went 2-for-5 with a double, triple, and two runs scored, including the game-winner in the bottom of the 10th. In his first game back in Rome on August 7, Encarnacion tagged three hits, scoring one run and driving in another. He pounded his first Shorebird home run in an August 11 game at Columbia. Named the Orioles' No. 15 prospect when he arrived in the system, Encarnacion showed off his blunt force in the Shorebirds' August 17 showdown against Charleston. Down 2-0 in the bottom of the eighth, Encarnacion came to bat with two on and one out. He then obliterated a 3-1 pitch down the left field line and out of Perdue Stadium. The three-run home run registered at 109 miles per hour off the bat and landed 434 feet away from home plate. Encarnacion's blast ignited a big Delmarva inning on the way to a 4-2 win. The Braves signed Encarnacion as an international free-agent on May 10, 2016. This past July 31, he was included in a six-player deal; the Orioles traded pitchers Kevin Gausman and Darren O'Day to Atlanta in exchange for Encarnacion and three other prospects. The SAL Postseason All-Star Team was voted on by the 14 teams' field managers, coaches, general managers, writers, and broadcasters. Asheville outfielder Casey Golden was named league MVP for the 2018 season, while Greenville southpaw Denyi Reyes earned Most Outstanding Pitcher, and West Virginia shortstop Oneil Cruz was tabbed as Most Outstanding MLB Prospect. Lakewood's Marty Malloy was named Manager of the Year; his pitching coach Brad Bergesen took home Coach of the Year.